Do you remember the book that turned you into a fan of an author? I have many favorite authors (Neil Gaiman, Robin McKinley, Garth Nix, and Patricia McKillip, to name a few), and I vividly recall the books that changed me from casual reader into devoted, ‘no really, I’ll read ANYTHING you write’ fan. With Gaiman it was Neverwhere; with McKinley, The Blue Sword, and for Nix, Sabriel. For Patricia McKillip, my go-to high fantasy fix? The Forgotten Beasts of Eld. Sixteen when a baby is brought to her to raise, Sybel has grown up on Eld Mountain. Her only playmates are the creatures of a fantastic menagerie called there by wizardry. Sybel has cared nothing for humans, until the baby awakens emotions previously unknown to her. And when Coren—the man who brought this child—returns, Sybel's world is again turned upside down. 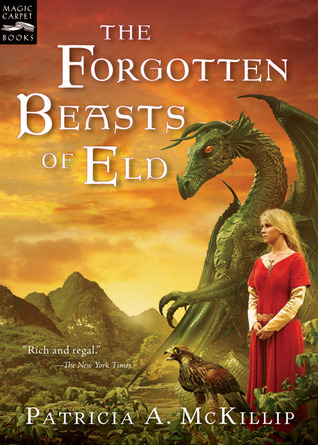 I read Patricia McKillip’s World Fantasy Award-winning The Forgotten Beasts of Eld at age eighteen, during my first year in college. I found it interesting and strange, but didn’t particularly like it. However, it did introduce me to Patricia McKillip, and from that moment on I read anything she published (and most of her backlist, too). Recently while browsing the teen sci-fi and fantasy section at my locally library I came upon it again and thought it worth the re-read. As an adult re-acquainting myself with this book, I see it with a clarity that I did not before, and perhaps have a greater appreciation for it. McKillip always writes about the tricky, unknowable intent of the heart. Well, and magic of course! In The Forgotten Beasts of Eld she explores themes of independence, power, responsibility, familial duty, deception and forgiveness. But above all, the book is about knowing oneself. I rather think that part of the reason I didn’t love it the first time out was that I didn’t yet know myself, and couldn’t see the complex motivations of the characters for what they were – an explanation of truth. Though Sybel’s story is classified as YA, it would now I think be a little hard to place. The protagonist starts quite young, but by the end of the book she has raised a child. In any case, while the issues are deep and the scope broad, the fact that the book is fantasy helps soften the edges a bit and younger readers will likely gloss over things they do not understand (like I did). Recommended for: an easy entrance into a world of exquisitely written high fantasy, and fans of Robin McKinley, Patricia C. Wrede and Kristin Cashore. Oh wow! I remember this book! I read it and several other McKillip books when I was younger- WHICH WAS A WHILE AGO because I'm old! It would be nice to revisit since my memory of them is a little vague. Thank you so much for sharing. Ah, man. I love McKillip! I actually read this one after almost all of her others. But those are some good author comparisons you picked. Great choice. I've never heard of this author which isn't surprising. I wasn't reading much in the beginning of college and certainly not fantasy. I thought it was weird. Not so today, but then by the time I declared my major, I had no time to read except the novels that were assigned to me. I didn't start reading fantasy until I became a blogger! Many yrs. later. I'll have to add this author to my TBR pile. I've really begun to like fantasy if the world isn't so foreign that I can't understand it. I haven't reread this one in forever...I want to now!